Is Mommy’s kiss goodnight. Sweet dreams, little one! Mommies and babies aren’t the only ones who enjoy sharing kisses. All throughout the farm, animal families snuggle up with their little ones, offering them warmth and love. 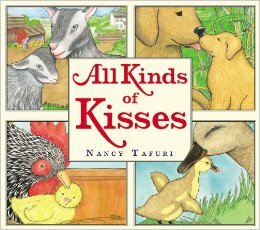 Following a mama bird on her journey back to the nest to give her own baby some special cuddles, Nancy Tafuri uses beautiful, inviting illustration to share how different creatures, from peeping ducks to mooing cows, show their love and affection in very similar ways. 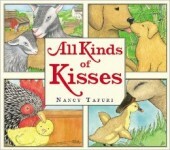 A heartfelt homage to all of the wonderful kinds of kisses. Published by Hachette Audio. Narrated by Emma Walton Hamilton.